Commentary on tech, law, and politics from Stephen McLeod Blythe LLB. LLM. I took the time to read through the full judgement (PDF), which is something of a master class in British constitutional law and statutory interpretation; full of exactly the points that I and other legal commentators have been making since the EU referendum was announced relating to British Parliamentary sovereignty. Specifically, the judgement superbly outlines and solidifies limits on the Royal Prerogative, which is a power oft-criticised for its vast, unchecked reach, and past abuses. Essentially, the judgement was that based on the Diceyan principle of Parliamentary Sovereignty; that it is the British Parliament who must give the Article 50 notification; not the Government via the Royal Prerogative. 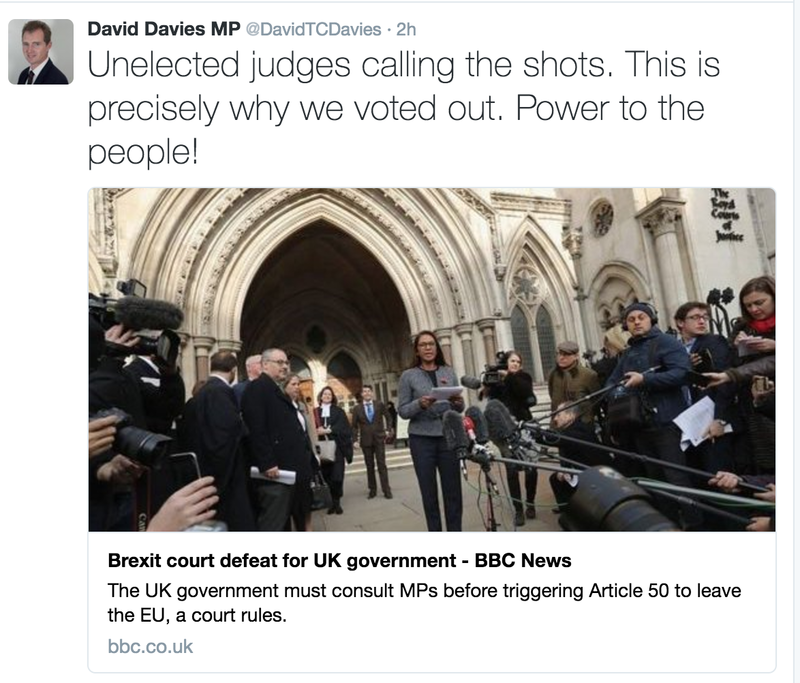 Despite the strong, and reasoned nature of the judgement, the response from those who voted to leave has been almost unbelievable, with Conservative MPs declaring that the Government should not be bound by unelected judges (which is literally, the entire basis of the rule of law), and that the decision to require Parliament’s involvement is ‘disgraceful’. Dictionary definition of contradiction in terms. To be clear: today’s judgement was not about whether or not we leave the EU; instead, it simply re-asserted the sovereignty of the British Parliament, which is exactly what the leave campaign was arguing had been lost in the first place. If Parliament does decide to completely refuse to trigger Article 50, then that would arguably be a disgrace. The referendum was held, and the outcome should be respected; something that I have repeated time and again on this blog. However, Parliament should be involved. The UK voted to leave the EU, yes, but the kind of exit was never specified. We were faced with the prospect of having the most extreme form of severance possible, thrust forward at the whim of an unelected Prime Minister. Instead, now we have Parliament involved in determining the kind of exit. The Government argued in it submissions that Parliament would most likely have the chance to vote on any deal that was reached with the EU before it was implemented, and that it wasn’t necessary to have Parliamentary approval to trigger Article 50. The Court quite sensibly rejected this notion, on the basis that by the time any such vote came around, there is the real chance that the time limit imposed by the European Treaty would run out, and leave us with no rights or compromises. By all means, get angry if Westminster completely refuses to ever trigger Article 50, but to be outraged at the principle that the British Parliament should be involved in the implementation of one of the most significant political processes of our lifetime is plainly just nonsensical. To reiterate: today’s question isn’t about whether or not Article 50 should be triggered, but who has the power to do it – on behalf of the people. Of course, all of this is subject to a final appeal to the Supreme Court, so we will see what happens in the next leg.